(Photo: Reuters / Osservatore Romano)Pope Francis (R) embraces Ecumenical Patriarch Bartholomew from Istanbul during a private meeting at the Vatican March 20, 2013. Pope Francis urged members of all religions and those belonging to no church on Wednesday to unite to defend justice, peace and the environment and not allow the value of a person to be reduced to "what he produces and what he consumes." 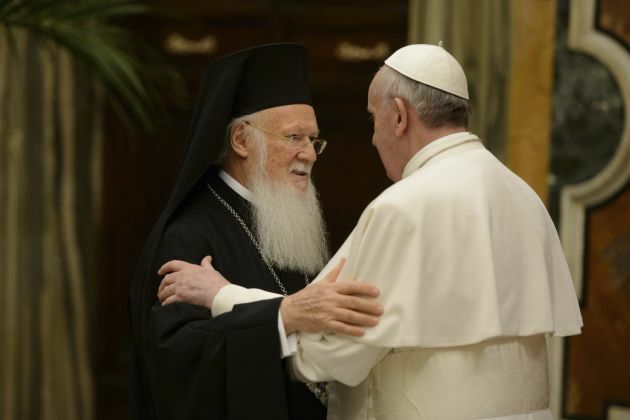 Ecumenical Patriarch Bartholomew I met Pope Francis I Wednesday in an historic audience involving the leaders of the Eastern Orthodox Church, other religious heads and the Roman Catholic Church's leader for the first such meeting since a schism in 1054. Bartholomew, who is the Ecumenical Patriarch of Constantinople based in Istanbul, was the first head of the Eastern Orthodox Church to attend a papal enthronement since his church split with the Catholic Church more than 1,000 years ago. He thanked the Catholic Church's Pontifical Council for the Promotion of Christian Unity, "for the help it continues to offer in my name, for this noble cause." Pope Francis received several dozen representatives of Christian churches and other world religions, who attended the papal inauguration on March 19. "For my part, I wish to assure, in the wake of my predecessors, the firm wish to continue on the path of ecumenical dialogue," said Francis. "I ask you, dear brothers and sisters, to bring my cordial greetings to the Churches and Christian communities who are represented here. And I ask you for a special prayer for me so that I can be a pastor according to the heart of Christ." Among those at Wednesday's were several leaders from the Orthodox Church, Orthodox Oriental Church, the Anglican Communion, and various Protestant churches, including the Lutheran, Baptist and Methodist churches. The Ecumenical Patriarch is aligned with the World Council of Churches, a grouping of mainly Anglican, Orthodox and Protestant churches representing more than 560 million Christians. Pope Francis also met the general secretary of the Geneva-based WCC, Rev. Olav Fykse Tveit, a Norwegian Lutheran. The Catholic Church is not a member of the WCC, but serves on several of its Faith and Order Committees and cooperates in many other spheres including in humanitarian projects. In an audience with Pope Francis earlier Lutheran World Federation president, Bishop Munib A. Younan, the first Palestinian to lead his communion of churches represnting 70 million members, offered the new pontiff a painted cross from El Salvador. "May this serve as an encouragement so that you offer your pastoral experiences in Argentina as gifts for this new service into which you have been called. We pray for your contributions to become a blessing for the Church," Younan said. During the audience at the Vatican, LWF General Secretary Rev. Martin Junge, a Chilean theologian, offered the Pope a copy of the LWF publication on external debt, titled Not Just Numbers. "As an Argentinean you know what the external debt, in many aspects illegal and illegitimate, can do to human beings. Our relationship and our unity, received as a gift of God, unfold their full meaning when we see them in the context of God's promise of life in abundance to all human beings," Junge noted. Referring to the nearly five decades of dialogue between Lutherans and Catholics, the LWF general secretary pledged the Lutheran Communion's commitment to continue its ecumenical dialogues. "A church can't be on its own. It requires the strong bonds of relationships, exchange and mutual uplifting. Ecumenical dialogues are a substantial expression of what it is to be a church in today's society," Junge said. With that in mind the Lutheran leaders reiterated their invitation and commitment to engage with Catholics as the LWF marks the 500th anniversary of the launching of the Lutheran Reformation in 2017. READ: Full transcript of Pope Francis' talk with religious leaders on March 20, 2013.